The park is located about 112 km (70 mi) north of the town of Puerto Natales and approximately 312 km (194 mi) north of the city of Punta Arenas. The Bernardo O'Higgins National Park neighbours Torres del Paine to the west, and the famous Los Glaciares National Park is located further north on the Argentine side of Patagonia. Torres del Paine is a very popular destination for hikers from all over the world. The entire Park contains clearly marked paths and many "refugios" which provide basic services and shelter for backpackers. The views in the park are absolutely breathtaking. Visiting Torres del Paine is recommended from the months of October until late March or early April. During these months the weather is nicer, and daylight hours are long, due to the extreme southern latitude. The Torres del Paine National Park is located in Chile's Region XII, between the massif of the Los Andes Mountain Range and the Patagonian steppes, in Ultima Esperanza Province, community of Torres del Paine. The Torres del Paine National Park is open all year round and is administered by the National Forestry Commission (CONAF), www.conaf.cl. Its entry gates are about 72 miles (115 kilometers) from Puerto Natales. The Sarmiento and Laguna Amarga entry gates are open from 8.30 a.m. to 8.30 p.m., all year round. The Torres del Paine National Park and environment has four types of vegetation - pre-Andean scrubland on the banks of rivers and lakes; Magallanes forest made up of species of the Nothofagus genus; Magallanes tundra, typified by the presence of bent-over bushes, cushions of plants and pasturelands; and high altitude vegetation above the forests, which disappears as the altitude increases. The park has a wide variety of bird species, with about 100 visible species, including especially Andean Condor (Vultur gryphus), Black-chested Buzzard Eagle (Geranoaetus melanoleucus), Black-necked Swan (Cygnus melanocoryphus), Chilean Flamingo (Phoenicopterus chilensis), Spectacled Duck (Anas specularis), Magellanic Woodpecker (Campephilus magellanicus), Ringed Kingfisher (Ceryle torquata), Patagonian Sierra-Finch (Phrygilus patagonicus), Common Diuca-Finch (Diuca diuca) and Rufous-collared Sparrow (Zonotrichia capensis). This diversity of Patagonia environments leads to presence of a large number of mammals, including the Puma (Felis concolor), Guemal (Hippocamelus bisulcus), Guanaco (Lama guanicoe), Chilla Fox (Canis griseus), Culpeo Fox (Canis culpaeus) and Skunk (Conepactus chinga). Lady Florence Dixie, in her book published in 1880, gave one of the first descriptions of the area and referred to the three towers as Cleopatra's Needles. She and her party are sometimes credited as being the first "foreign tourists" to visit the area that is now called Torres del Paine National Park. Several European scientists and explorers visited the area in the following decades, including Otto Nordenskiöld, Carl Skottsberg, and Alberto María de Agostini. Gunther Plüschow was the first person to fly over the Paine massif. The park was established in 1959 as Grey Lake National Tourism Park and was given its present name in 1970 called Torres del Paine National Park. 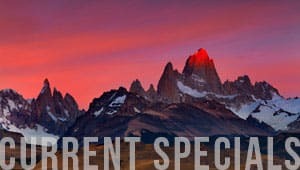 In 1976, British mountaineer John Gardner and two Torres del Paine rangers, Pepe Alarcon, and Oscar Guineo pioneered the Circuit trail, which circles Torres del Paine’s three towers. In 1977, Guido Monzino donated 30,000 acres to the Chilean Government when its definitive limits were established. The park was designated a World Biosphere Reserve by UNESCO in 1978. The landscape of the park is dominated by the Paine massif, which is an eastern spur of the Andes located on the east side of the Grey Glacier, rising dramatically above the Patagonian steppe. Small valleys separate the spectacular granite spires and mountains of the massif. These are: French Valley, Valle Bader, Valle Ascencio, and Silence Valley. The head of French Valley is a cirque formed by tall cliffs. The colossal walls of Cerro Cota 2000 and Cerro Catedral punctuate the western region of the Valley. 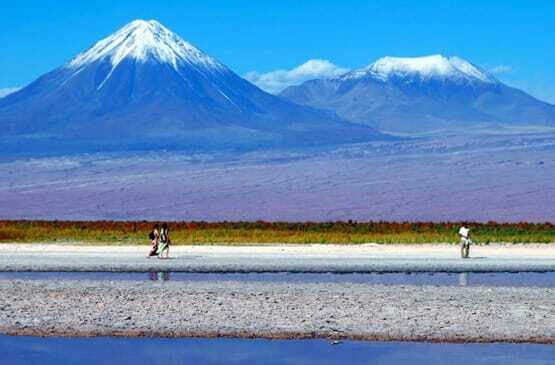 Cerro Cota 2000 is named for its elevation; its highest contour line is about 6,562 ft. (2,000 m). Cerro Catedral is named so because its east face resembles a cathedral's facade. To the north stands the granite arête called Aleta de Tiburón (English: Shark's Fin). To the east, from north to south, lie the peaks Fortaleza (Fortress), La Espada (The Sword), La Hoja (The Blade), La Máscara (The Mummer), Cuerno Norte (North Horn), and Cuerno Principal (Main Horn). In the Valley of Silence the gigantic granite walls of Cerro Fortaleza and Cerro Escudo (Shield Mountain) stand face to face with the western faces of the Torres del Paine. Ascencio Valley is the normal route to reach the Torres del Paine lookout, which is located at the bank of a milky green tarn. The highest mountain of the group is Paine Grande, whose height was measured in 2011 using GPS and found to be 9,462 ft. (2,884 m). The Southern Patagonian Ice Field mantles a great portion of the park. Torres del Paine glaciers include the Dickson, the Grey, and the Tyndall glaciers. Among the lakes are the Dickson Lake, Nordenskjöld Lake, Pehoe Lake, Grey Lake, Sarmiento Lake, and Del Toro Lake. Only a portion of the latter is within the borders of the Torres del Paine National park. All are vividly colored, most due to rock flour suspended in their waters. The main river flowing through the Torres del Paine Park is Paine River. Most of the rivers and lakes of the park drain into Última Esperanza Sound via Serrano River. Much of the geology of the Torres del Paine area consists of Cretaceous sedimentary rocks that have been intruded by a Miocene-aged laccolith. Orogenic and erosional processes have shaped the present-day topography, and glacial erosion is mainly responsible for the sculpturing of the massif in the last 10,000 years. A good example of the latter is the Cuernos del Paine, whose central bands of exposed granite contrast strongly with the dark aspect of their tops, which are remnants of a heavily eroded sedimentary stratum. In the case of Las Torres del Paine, what once was their overlying sedimentary rock layer has been completely eroded away, leaving behind the more resistant granite. In 1985, a tourist started a fire that burned about 58 sq. mi (150 km2 ) of the park. The blaze affected the areas east and south around Lake Pehoé. In February 2005, an accidental fire started by a Czech backpacker, which lasted for about ten days, destroyed 60 sq. mi (155 km2 ) of the park, including about 2 km² of native forest. The Czech government offered aid after the fire and donated $1 million to reforestation efforts. In late December 2011 through January 2012, a fire blamed on an Israeli backpacker burned about 68 sq. mi (176 km2 ) of the reserve, destroying about 36 km² of native forest and affecting most of the areas around Lake Pehoé and the western areas around Lake Sarmiento, but moving away from the Cordillera del Paine, the park's centerpiece. The Israeli government sent reforestation experts to the zone, and has committed to donate trees to replant the affected areas. Nevertheless, recent paleo environmental studies performed within the Torres del Paine National Park indicates that fires have been frequent phenomena at least during the last 12,800 years.